The day Jack Couch realized that the church he founded and pastored for 20 years wasn’t going to survive any longer, he could only see death. 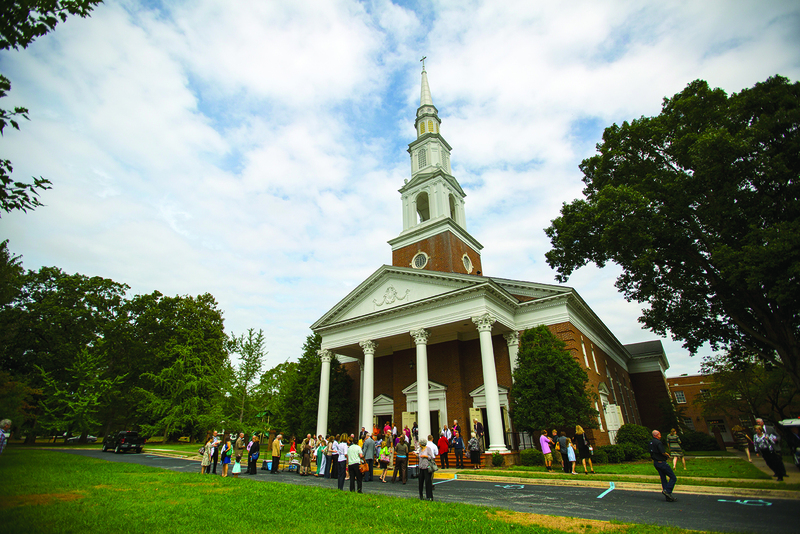 Boulevard Baptist Church in Anderson, S.C., is now home to the combined community of Clearview Baptist and Boulevard Baptist. After the life-giving merger of the two congregations, Boulevard rededicated itself to a holistic vision of mission in its local community and around the world. Clearview Baptist Church had lost the critical mass of families and individuals needed to sustain its budget. It had lost the ability to retain a seven-acre property just north of Anderson, S.C., and continue ministry there. The church had lost footing in a community that had drastically changed around it. Yet, at a time when Clearview had few resources to speak of, there was one commodity still in abundance. It had partners. It had friends. And ultimately, through a long-standing relationship with Boulevard Baptist Church in Anderson, it had a plan to continue partnering to renew God’s world. It just took a little time and some trusted friends to see new life, Couch said. It was in a Cooperative Baptist Fellowship Peer Learning Group in 2009 that Couch and ministers from Boulevard first began to see new life. Clearview had a gifted ministerial staff, relationships in the Anderson community and a seven-acre piece of property to sell — not to mention a group of people still dedicated to being a part of this church family. After many meetings and a couple of votes, Clearview closed its doors, transferred its assets and formed together with Boulevard to continue its story in Anderson. Rose Rettew takes part in a sensory experience of Easter at Boulevard Baptist. Those opportunities began as a transition team, comprised of four members from each congregation, created a covenant to guide the church as they formed a new family and identity together. The team appointed two members of Clearview to the Boulevard deacon team, planned a series of congregational information sessions and drafted a three-part plan for the allocation of Clearview’s financial assets — namely from the sale of the church’s property. First, the plan provided Couch and his administrative assistant, Karin Watson, a salary to officially join the Boulevard staff. Second, no more than 25 percent of Clearview’s resources would be used toward retiring Boulevard’s debt. Third and finally, the remainder of resources would be allocated to mission partners outside of Boulevard’s walls in Anderson and around the world. During his first two years as minister of community care at Boulevard, Couch conducted 40 funerals, 75 percent of which were for families who did not belong to the church, and found more missional freedom than he had ever dreamed. In this new role, Couch was instrumental in launching an affiliate of Family Promise, an interfaith hospitality network committed to helping families facing homelessness in Anderson County. Couch also brokered a partnership with United Way and helped establish South Main Chapel & Mercy Center, a church-seeking community and sustainable assistance initiative for low-income individuals in Anderson’s Orrville neighborhood. Boulevard pastor Johnny McKinney said Couch and Clearview members made a seamless transition and created new opportunities for the church to engage its community. The two congregations came together harmoniously, he said, because they already saw themselves as part of the same story. 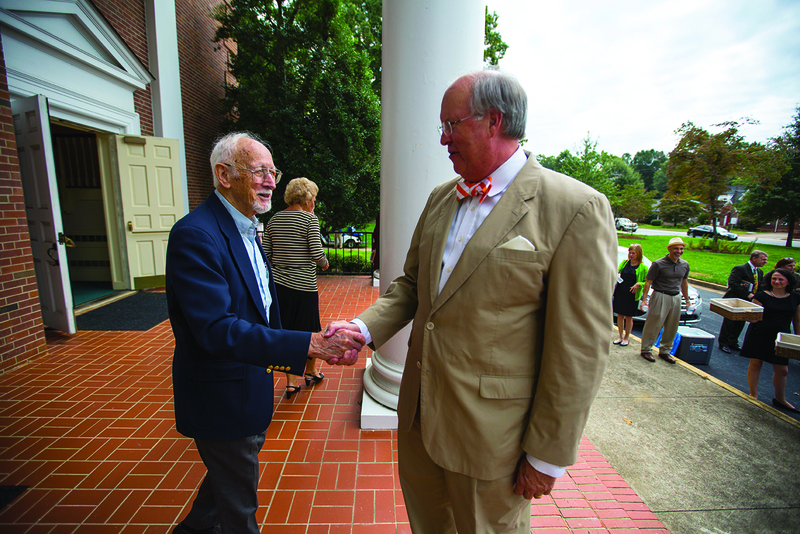 Pastor Johnny McKinney (right) greets member John Hodges after church. That mission blew wide open earlier this year as Boulevard completed the sale of Clearview’s property and appointed a Mission Council to designate $370,000 to the church’s mission partners. The council, made up of both Clearview and Boulevard representatives, met to pray, discern, tour Anderson together and even dialogue with local leaders about the community’s needs. The result was an initial distribution of $140,000 in 2015, with another $105,000 to be distributed over the next three years to partners in Anderson and around the world. Recipients include CBF-partner Rauschenbusch Metro Ministries in New York City, Free Clinic of Anderson, South Main Chapel & Mercy Center, Anderson Interfaith Ministries, and Project Ruth in Bucharest, Romania, a ministry of CBF field personnel Ralph and Tammy Stocks. The Mission Council also boosted Boulevard’s ministry scholarship fund to assist seminary students pursuing full-time ministry and even started a mission endowment fund to grow an initial $125,000 and create a continual stream of funding toward mission partners in the future. Ellen Sechrest, Boulevard’s minister of spiritual formation and missions, said the Mission Council has not merely enabled the congregation to give more money to its partners but has inspired the individuals of Boulevard to partner with them in the work of renewing God’s world. One of those opportunities, Sechrest said, is with Safe Harbor, a local partner that provides safe shelter, counseling and advocacy for victims of domestic violence in a four-county area. Safe Harbor will receive $4,000 over the next two years as well as teams from Boulevard to provide ongoing help in cooking meals and remodeling its facilities. 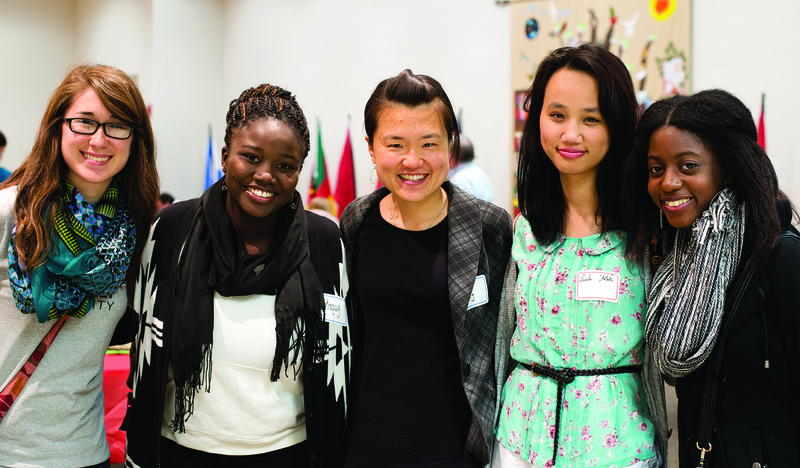 Members of the local community come together at Boulevard Baptist’s Annual Community International Dinner hosted by the church’s international ministry, which offers Japanese worship services, counseling and Bible study, and partners with other congregations and agencies in the region to reach out to the diverse international community in Anderson, S.C. In December 2014, the Barna Group reported that the number of “unchurched” people in the United States (around 156 million) would comprise the eighth most populous country in the world if put together. 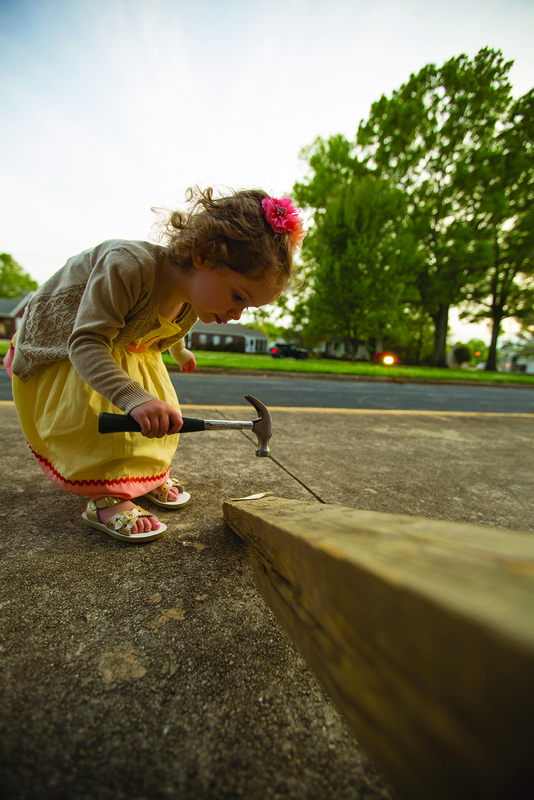 And in an increasingly post-Christian context, Boulevard and Clearview are modeling a way to embrace a new and even exciting reality, said Jay Kieve, coordinator of CBF of South Carolina. Ultimately, McKinney said, forming together has enabled Boulevard to do more than the two churches ever could have done alone. Boulevard Baptist Church’s other partners and recipients of the church’s missional giving include Dawnings, CBF’s congregational renewal initiative, and Meals on Wheels of Anderson, Homes of Hope, Haven of Rest, the Baptist Medical Dental Mission in Honduras and Sanga Kunwar, a mission worker in Nepal. Learn more at http://www.boulevardbaptist.com.